To end our home assignment journey, we made a visit to the NC Lutheran Synod Office, but first went out to eat for breakfast with Bishop Bolick and several of the NC Synod staff. After wonderful conversations around eggs, sausage, grits and pancakes (just to name a few of the yummy breakfast foods ordered), we all went to the office for weekly devotions. 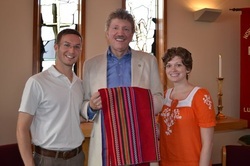 To conclude our time at home this summer and to begin our transition back to Bolivia, our friends and colleagues gave us a sending, blessing our lives and ministry in Bolivia. Justin and I are proud to say that we are from the North Carolina Lutheran Synod of the ELCA, which is dedicated to its work in God´s mission around the world. If you have been following this photo blog of our home assignment journey, you may have noticed that Resurrection Lutheran Church was not on our original list of places to visit when we began our travels. That´s because (and we are very proud to say) that they have recently decided to becoming a sponsoring congregation and we squeezed a last minute visit into our schedule. This meant that they too had to squeeze an extra trip back to the church in the afternoon and despite the heat and rain, there was a wonderful turnout! The children played on a bouncy house while we set up, everyone enjoyed lemonade and desserts and later, we gave our presentation with a questions and answer session at the end. We find it symbolic that our last official presentation was with you, a congregation with which we are just beginning a relationship, reminding us that God is always at work, even when we think a chapter is ending. To our brothers and sisters at Resurrection Lutheran, we´d like to say thank you for opening your doors and hearts to us. We look forward to deepening our relationship with you in the future. Even in Bolivia, Justin and I receive a newsletter in the mail from Philadelphia Lutheran Church! It is only fitting to mention that their support of not only the two of us, but also other ELCA missionaries dates back about twenty years. Here, we attended Sunday School, preached, presented and enjoyed a lovely potluck dinner. Thank you Philadelphia Lutheran for sponsoring us, spending time talking with us and sharing God´s love with your brothers and sisters in Bolivia! This was the second Summer Missionary Conference (SMC) that Justin and I have attended, with the first being two years ago, right before we left for Bolivia. I remember thinking during our first SMC just how cool it was to be in a room with missionaries from all over the world and ELCA-GM staff and I still think that way. It´s very refreshing to spend time with our colleagues and hearing everyone´s stories is for me, a highlight of our time together. From one country to another, there are as many differences as similarities, but as Pastor Rafael Malpica put it, "God wears a big pollera (or skirt)" and covers us all. During one of the general sessions, Dr. Abe Caceres sang a song that he wrote as part of the relief efforts after the earthquake in Haiti. These lines, taken from his song remind me of our interconnectivity and need for each other. "I am a part of you, you are a part of me...because we are one." May God´s peace and love surround us all as we continue to work where we are called. It was wonderful to share my birthday today with Bethlehem Lutheran Church in the Beverly Park Neighborhood of Chicago, IL. For me, it was great to spend time with the children during the children´s sermon and for Justin, preaching this Sunday was a pleasure too. After service, we both enjoyed sharing a little about our lives and ministry in Bolivia over lunch and answering all of the insightful questions from congregation members. Many thanks to Pastor Jennie for helping us get set up and comfortable with our surroundings and to all our brothers and sisters from Bethlehem for your kind words of wisdom and support. This week, Justin and I traveled (along with his parents) from Billings, Montana through Bismarck and Fargo to Grand Forks, North Dakota avoiding the storms and tornadoes. On Saturday, we met with Pastor Peter Coen-Tuff of United Lutheran Church for lunch and Dean and Tina Gruel for supper and today we attended the worship services there, preaching and presenting. A big thank you to everyone for welcoming us to worship with you, showing us around Grand Forks and for your support the last two years! Below is a copy of Justin´s sermon for all those interested in revisiting or sharing the message. God bless! Justin presented at a men´s breakfast about our ministry in Bolivia at Messiah Lutheran Church and went to a text study at Peace Lutheran Church to meet local pastors. All of the pastors enjoyed a pita lunch and Justin had a great time getting to know everyone! Bethlehem Lutheran Church is a small, family-oriented congregation in Billings, Montana and one of our sponsors. It struck the two of us as a congregation with many testimonies to tell. Quite a few of the members even visited Bolivia a couple years back and we enjoyed reminiscing about their trip and experiences together during a question and answer potluck after our presentation and two worship services. The Gospel this Sunday came from Matthew 13:1-9, 18-23 and as Justin preached "God and Jesus never fail to meet us despite whatever condition we´re in. God continues to sow year after year, tilling our soil and making us softer, cutting away the thorns that choke us and picking out rocks, so that we may bear fruit. What would happen if you believe the fruit that you bear shows the presence of God´s love in your heart to others?" We´d like to thank everyone from the Church for your support and prayers, Kris and Skip Mitzman for hosting us, and Paul and Kay Hanson for the lovely dinner. Even though members of St. John´s Lutheran Church were only told the Sunday before that we were able to come and visit with them, there was a great turn out for the event! As you can tell from the pictures, we shared a great hotdog/potluck dinner and dessert along with heart-warming conversation. We also used for the first time our projector to show pictures of what we do, where we live and about the Bolivian Evangelical Lutheran Church. We were amazed at how big it can project! If you take a look at the pictures, you´ll see that it projected on the WHOLE wall! Thank you St. John´s for making our gathering possible and we look forward to being in conversation with you in the future! Our first stop after arriving in Great Falls, Montana was to the home of Marjorie Holland. While in town, Margie was very kind to host us, give us the tour of the town, take us to yoga and out to dinner! We ate at a local diner and had the opportunity to meet Cathy Johnson, the lay pastoral associate at Bethel Lutheran Church. We also had the honor of being interviewed by Amanda Johnson for an article she´s writing for the Montana Synod Supplement and were able to spend time with Church members during an ice cream social where we presented. Another special moment was meeting Bishop Jessica Crist and her husband, Turner Graybill. At the end of our presentation, we presented Bishop Jessica Crist with a plaque from the Bolivian Evangelical Lutheran Church as well as a stole. Thank you all for your support, the delicious ice cream and fellowship! From North Carolina to Pennsylvania and Montana, we traveled a lot! Below is the schedule of where we visited and when. Disclaimer: This site is not published nor promoted by the Evangelical Lutheran Church in America (ELCA) nor the ELCA Global Mission Unit.